- Warming and moisturizing (heating the air of body temperature). 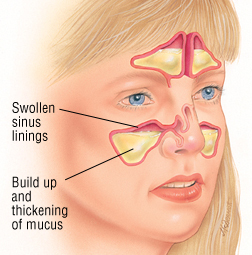 Acute sinusitis is a disease that, in the absence of adequate treatment, can lead to the development of severe complications. - Adverse working conditions (for example an elevated atmospheric pressure). - Increasing of body temperature to +38 ... + 39 ° C.
In the absence of adequate medical care, acute sinusitis can go on into a chronic form, as well as cause the spread of the inflammatory process to nearby tissues, up to the periosteum and meninges. The immediate goal of the treatment of sinusitis is to eliminate the edema of the mucous membrane, overlapping the openings of the tubules, providing an outflow of pathological contents. For this, vasoconstrictive nasal drops and sprays are used in clinical practice. With simultaneous bacterial infection, a patient is prescribed antibiotics that are selected with taking into account the sensitivity to the causative agent of sinusitis. The preventive measures include the treatment of rhinitis and the elimination of allergic reactions.